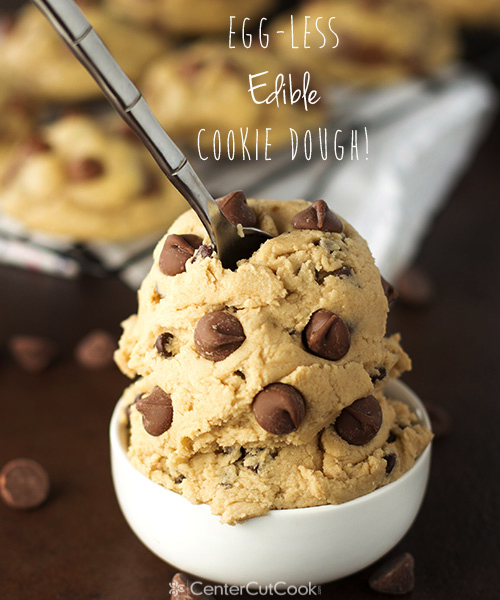 If you are anything like me, it is almost impossible to make a batch of cookie dough and not eat a at least a spoonful of raw dough! 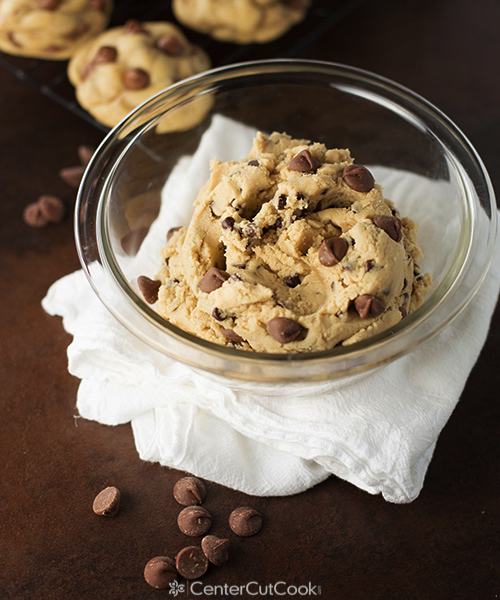 Of course you could always make the best chocolate chip cookies, but if you want just the edible dough go ahead and read on! But don’t forget to check out our recipes for Soft Sugar Cookies, Jumbo Chocolate Chip Cookies, Monster Cookie Dough Dip, and all of our other cookie recipes! The only problem is that after eating a scoop or two of cookie dough I feel partly paranoid that I just ate raw eggs and wonder if this will be the time that I get sick. 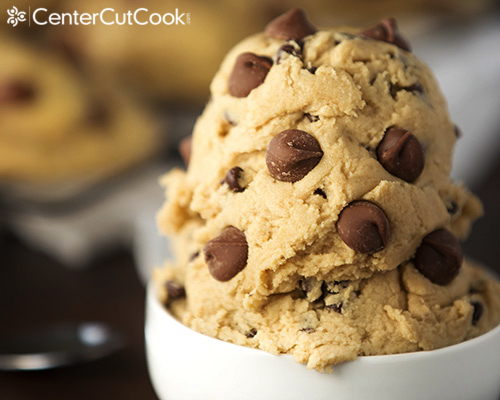 Have you ever gotten sick from eating raw cookie dough? I have yet to find someone that has, but I definitely don’t want to be the first! 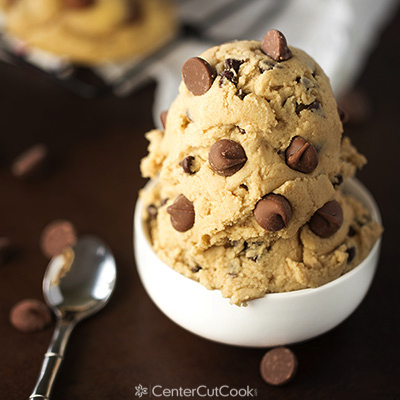 Given my love of raw cookie dough, can you imagine how excited I was when I came across a shop called Cookie Dough Creations? They have a cute little shop in Naperville, Illinois where they sell RAW COOKIE DOUGH and lots of it. How ingenious is that? All different kinds of raw cookie dough! 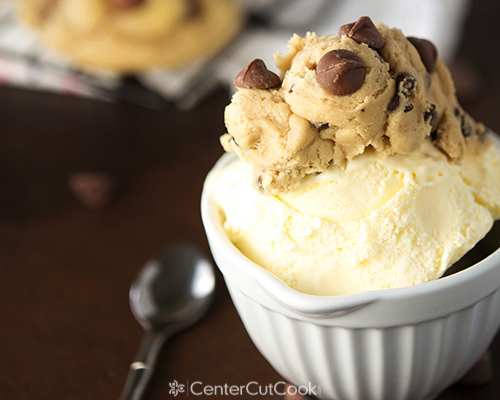 You can order just a cup of raw cookie dough, or use it as a topping on ice cream. It is this little shop that inspired me to make my own Edible Egg-less Cookie Dough that is safe to eat, right out of the bowl without worrying that you’ll get sick. This recipe comes together in minutes, and because it is made without eggs it is 100% safe to eat. Even better? It can be frozen for up to three months! I like to divide it up into small portions so that when I get the hankering for some raw dough, or I want to use it as a topping on ice cream, I can just thaw a small portion. I couldn’t decide whether I wanted to use the mini chocolate chips or the full-sized chocolate chips, so I used both. I love finding little bits of chocolate in my cookie dough, but I also loved the occasional big pocket of milk chocolate chips. UPDATE: Apparently there is also a small risk that you could also get sick from eating raw flour. Please consume at your own risk. UPDATE: It was brought to my attention that there is a small risk you can still get sick from eating raw flour. Please consume at your own risk.